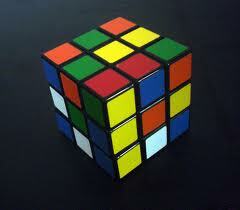 Come and compete in the CSI Rubik’s cube competition! November 14, 2013, College of Staten Island of CUNY, 1S-107, 2:30 pm. Sponsored by MTH 339, and the CSI Math Club. The Competition. 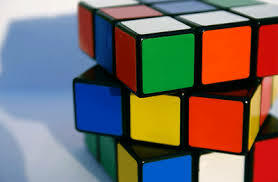 On November 14, 2013, we will have the Rubik’s cube competition, with several rounds of competition, to see who can solve the cube the fastest. Prizes will be awarded, and best of all, there will be free pizza! The event has now taken place. We had 15 competitors, from all around the College and beyond. We organized two qualifying heats of 7 and 8 competitors, respectively, taking the top four from each qualtifying heat to form the quarterfinalist competitors. The top four of these formed the semifinalist competitors. And the top two of these headed off in the championship round. The champion, Sam Obisanya, won all the rounds in which he competed, and his cube was a blaze of lightning color as he solved it. Honorable mention goes especially to Oveen Joseph, who faced Sam in the championship round and who came out to the college from middle school I.S.72, where he is in the 7th grade, and also to Justin Mills, who had extremely fast times. Congratulations to our champion and to all the competitors. This entry was posted in Events, Talks and tagged games, math games, Rubik's cube by Joel David Hamkins. Bookmark the permalink. How are you going to ensure that the cubes are distributed fairly between the contestants? Are they all going to be rotated using the same algorithm (with perhaps variances in the initial orientation of the cube), or are you going to rely on chance and just have them solve three cubes or so? Nice point Asaf! Justice is very important! In Sudoku competitions at our department we have a hierarchy of easy, medium and hard tables. Asaf, well, we specifically discussed this, and decided to just scramble the cubes randomly, with a take-your-pick chance element, although we will have several rounds. I think we’ll have about fifteen or more contestents, so well go to the top eight after the first round, and then top four, top two and then championship. Ah, that sounds reasonable within probability. Now, what about that free pizza? Do you actually have to show up at CUNY for that, or can any grad student claim a slice? Cool competition. Shame I missed it. that was a fun competition! by the way it was I.S.72 it was a great opportunity representing my school.